The LK seamer is designed to close heavy wall containers of round, oval, rectangular or irregular shape with a minimum radius of 1/4" and a maximum diameter of 7". Custom machines to accommodate larger sizes can be supplied. The standard machine will seam cans of heights from 1/2" to 8". Again, custom machines to accommodate taller sizes can be supplied. The maximum seaming rate is 16 cans per minute and is operator dependent. Typical actual rates are ~12 cans per minute. We can develop custom tooling/roller profiles to seam your most difficult cans. The LK seamer design eliminates the classic weak points of semiautomatic seamers, resulting in fewer moving parts, a lighter, small, quieter machine with less required maintenance. All this at a lower cost than even rebuilt competitive machines. Click here to view a short demo video of our LK seamer. Easy set up and operation Set up is fast and easy. Change overs for different heights can be accomplished in seconds and different can sizes can be set up in minutes. The ability to micro adjust each roller height and seaming pressure independently means optimum seaming even with lot to lot variations in cover and can tolerances. The air operated lift mechanism allows the operator to maintain a seated position for minimum fatigue. High reliability The LK seamer design has been proven in years of continuous production closing millions of cans per machine with no more than routine greasing at 50,000 can intervals. There are no clutches to wear out or belts to break. Fewer moving parts means less wear, less downtime, and fewer service parts in inventory. Small footprint The small footprint of the LK seamer allows it to be set up in the most convenient location for work flow. Its light weight and use of wheels means it can be quickly and easily repositioned to adapt to changing needs. Clean and quiet The LK seamer is quiet and clean. 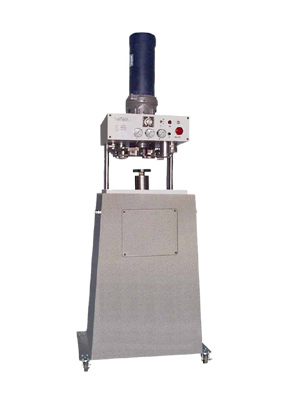 No oil throw from rotating cam mechanisms, clutches, belts, or pulleys means it can be set up in laboratory spaces. The direct drive motor runs only when seaming and is so quiet operators need no special hearing protection.